Bummed out about your dying citrus trees? Yearning to learn about other fruit alternatives? Sponsored by: Doug Caldwell, UF|IFAS Landscape Horticulture and Jessica Ryals, Food Sustainability Educator. 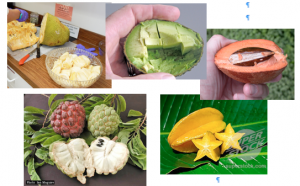 Louise King will give a presentation on how to best grow the JAMAS alternatives and other fruit such as jaboticoba, sapodilla, white sapote, bananas and other fruit trees in south Florida. Louise is a horticulturist at the Fruit and Spice Park in Homestead and owns a lychee and sapodilla nursery. There will be a fruit tree raffle and fruit tasting. Louise is a Redland resident and tropical fruit grower for more than 20 years. She is on the board of the South Florida Soil and Water Conservation District and vice-president of the Tropical Fruit Growers of South Florida. Plant problems? Bring samples in bags & we will diagnose it! 2 FNGLA CEUs; Cost: $10 Call 252-4800 if any questions.